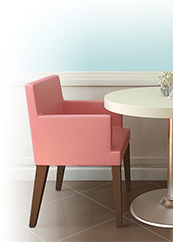 RestaurantFurniture4Less.com provides quality restaurant furniture, as well as food service equipment and supplies at affordable prices with a Best Price Guarantee on designated products. With 3 distribution centers and 1.5 million square feet of warehouse space, many products are in stock and ready to ship. Featuring more than 33,000 products from around the globe, our buyers focus on bringing you the most up-to-date trends in the restaurant industry. Restaurant Furniture 4 Less carries everything you need for your eating establishment, including a complete line of restaurant furniture, kitchen, restroom and janitorial supplies, as well as hundreds of bar and counter stools in the latest styles and dozens of colors. Most of our products are commercial grade and suitable for use in restaurants, hotels and nightclubs. Our mission is to provide an incredible selection of quality restaurant furniture for commercial and residential use and all the equipment and supplies you need to succeed at unbeatable prices with fast delivery and excellent customer service.